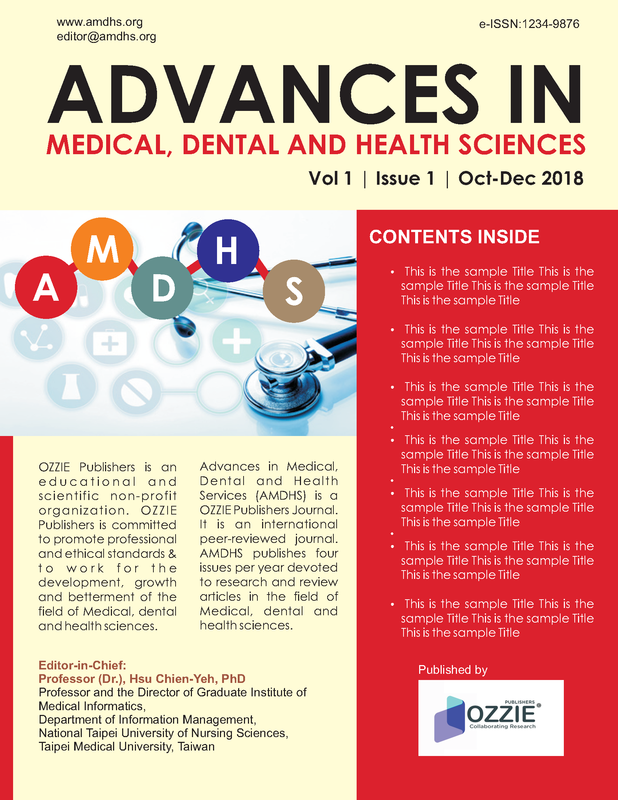 Advances in Medical, Dental and Health Sciences (AMDHS) [www.amdhs.org] [e-ISSN : AF] is a OZZIE Publishers journal. It is an international peer-reviewed journal. AMDHS publishes four issues per year devoted to research and review articles in the field of Medical, dental and health sciences. AMDHS welcomes articles with theoretical or applied approaches, focusing on different phases of medical, dental and health sciences research; medical, dental and health production and management; discovering new medicines, new technologies and new ways to manage human health. Research papers can represent broad range of medical, dental and health related sciences including biochemistry, epidemiology, genetics, pharmacology, endocrinology, biomedical engineering, clinical and laboratory sciences, physiotherapy, and psychology. All articles are now welcome. AMDHS provides DOI (Digital Object Identifier) to each published article. All published articles are indexed in Google scholar, China National Knowledge Infrastructure (CNKI), CrossRef and under process in Directory of Open Access Journals, EBSCO Publishing's Electronic Databases, Hinari (WHO) and Index Copernicus etc. All articles published in AMDHS are made open access immediately. Aden; dental; Pharmacy; Medical; Students; Pharmacovigilance; Comparison; Yemen. Altered hematology and Quality of life. Copyright © 2018 AMDHS. All rights reserved.